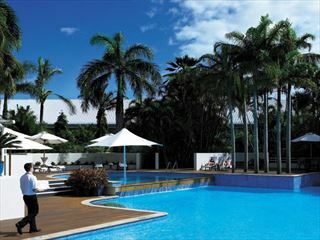 Hilton Cairns Hotel, Australia. Book at Australian Sky. 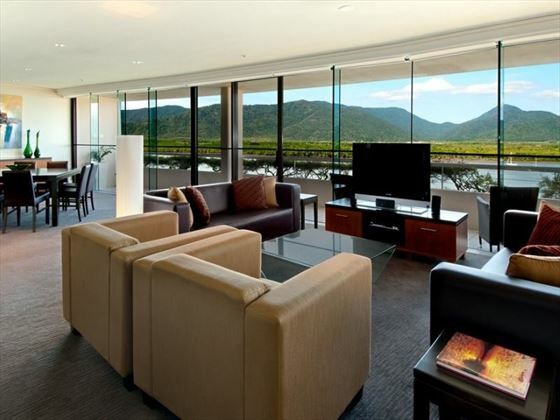 With stunning scenery, first-class service and stylish accommodation, you’ll feel like a VIP at the Hilton Cairns Hotel. 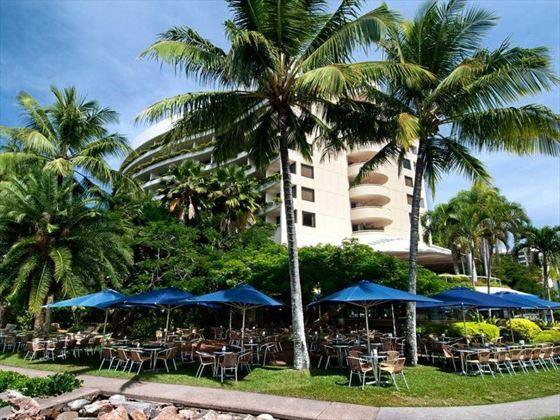 Nestled on the tropical Trinity Inlet, only a short distance from Cairns city centre, this chic hotel is in the perfect spot to enjoy the waterfront restaurants, shopping and bars, with the best attractions this vibrant city has to offer, as well as fantastic water sports in the Great Barrier Reef. Featuring views of the waterfront and luscious green mountains, you’ll have incredible backdrops as you enjoy the hotel’s outstanding amenities, including a wide range of well-apponted, modern rooms, al fresco dining, a lagoon style pool, fantastic fitness and wellness facilities, and live music every Friday. 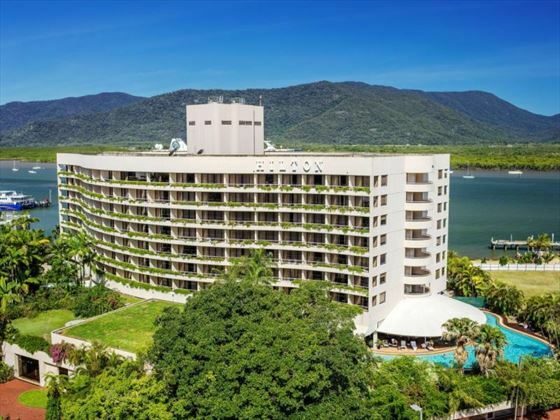 This sophisticated hotel is nestled on Trinity Inlet, a tropical estuary only a short distance away from Cairns’ bustling city centre. 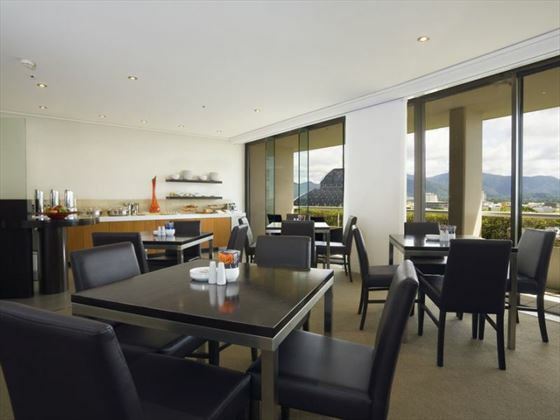 With views of the cityscape, the rainforest-covered mountains in the distance, and the waterfront just outside, this sleek hotel is in a beautiful, vibrant location. Close by to Cairn’s centre, there are plenty of restaurants, shopping and bars to explore both in the city and along the waterfront. With the Great Barrier Reef right at your doorstep, you’ll be close to fantastic water sports and excursions, including snorkelling, diving, hiking spots, and golf courses. 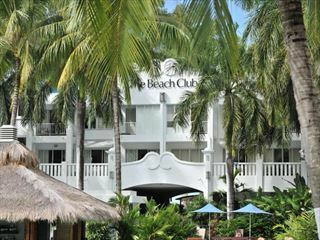 Double Hilton Deluxe – Comfortable 30sqm rooms with gorgeous waterfront views, featuring two double beds. Sleeps a maximum of four adults. Double Hilton Guest room – Modern 30sqm rooms with stunning views of the city and soaring mountains, featuring two double beds. Connecting rooms are available, so these are perfect for large groups and families. Sleeps a maximum of four adults. 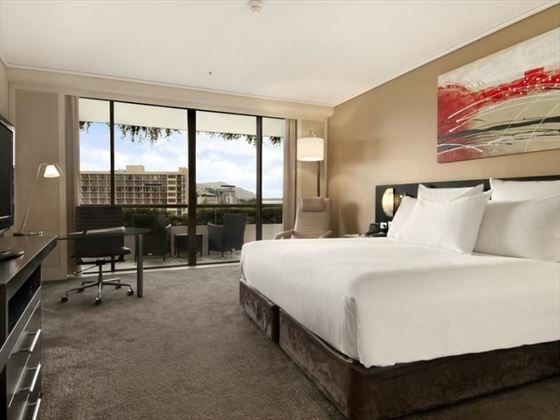 King Hilton Deluxe – Lovely 30sqm rooms with views of the esplanade, featuring a king size bed and additional rollaway bed. Sleeps a maximum of three adults. 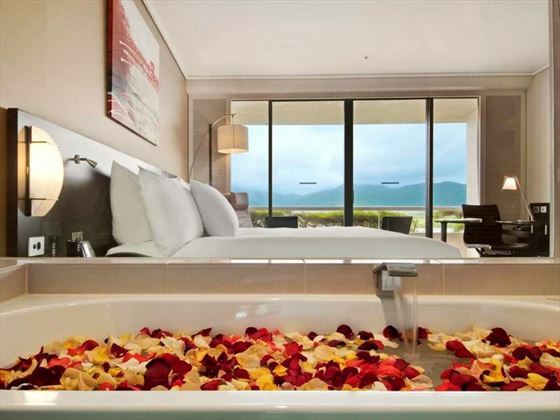 King Hilton Guest Room – Enjoy panoramic views of the city and mountains in the distance. Features a king bed and rollaway bed, and sleeps a maximum of three adults. Connecting rooms are available. Hilton Executive Spa Suite – Chic 60sqm suites with views of Trinity Inlet or the city, offering spa facilities and access to the Executive Lounge, including complimentary breakfast, evening drinks and canapes. Features a sitting area and king size bed, sleeping a maximum of three adults. Hilton Premier Suite – Luxurious 60sqm top floor suites with views of the waterfront, featuring a separate kitchen and living area, floor-to-ceiling windows, a marble bathroom with a whirlpool, and Executive Lounge access. Sleeps a maximum of three adults. 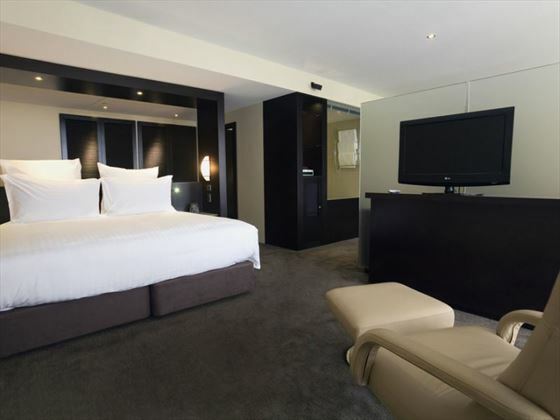 Double Hilton Executive Room – Smart 30sqm rooms with a work desk and ergonomic chair. 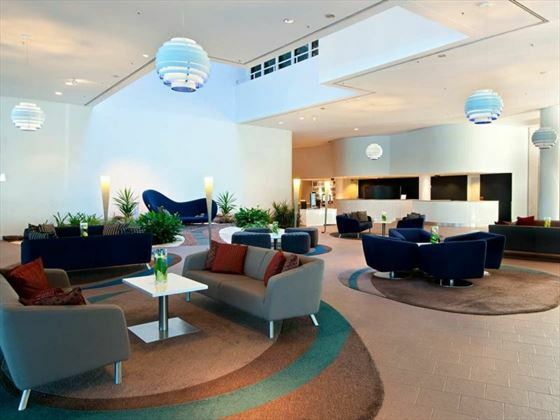 Sleeps a maximum of four adults, with access to the Executive Lounge and its benefits. Double Hilton Spa Room – Sleek 30sqm rooms with a personal hydrobath with aromatherapy oils, views of the mountains and two double beds. Sleeps a maximum of four adults. King Hilton Executive Room – Similar to the Double Hilton Executive Room, with mountain and city views and a king size bed and rollaway bed. Sleeps up to three adults. King Hilton Spa Room – With the same amenities as the Double Hilton Spa Room, featuring a king size bed and rollaway bed instead. Sleeps a maximum of three adults. 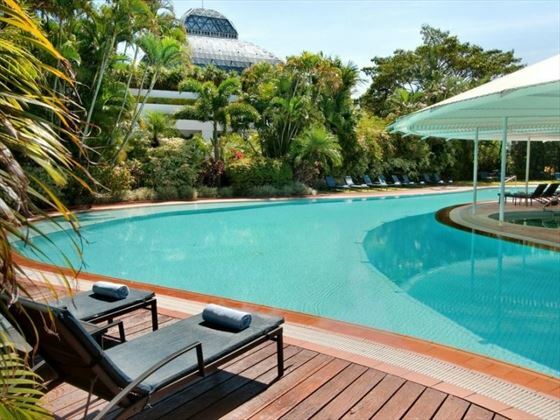 Café Sunrise – Tuck in to a buffet or a la carte breakfast with picturesque views of the gardens. Open daily 6.30am – 10.30am. Donnini’s – Enjoy delicious, simple Italian cuisine from 5.30pm-9.30pm daily. 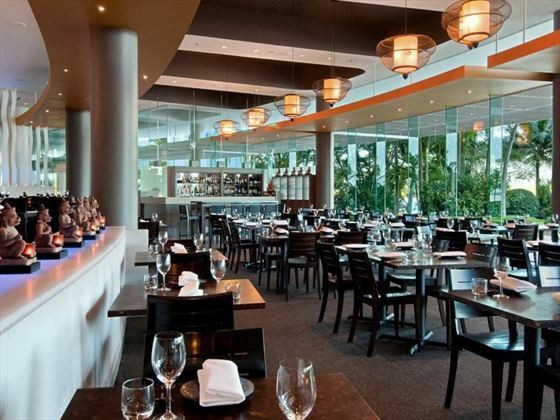 Mondo Café Bar and Grill – An award-winning al fresco dining experience along Trinity Inlet’s waterfront. The menu features plenty of decadent international cuisine, plus a Family Night every Tuesday, and live music every Friday. Open daily from 11am-11pm. Six Degrees Bar and Lounge – A chic bar open Wednesday to Saturday from 5pm till late. Featuring delicious signature vodka-based cocktails and light meals and snack – including a sumptuous chocolate fondue. Spa – with massage treatments, body wraps and facial treatments. Available for those aged over 16. Free night offer Stay 4 nights and pay for 3 or stay for 3 nights and pay for 2 (maximum 1 free night) Valid up to 31 Mar 20, certain room types and date restrictions apply. Free breakfast Stay 3 nights and receive a full breakfast daily when staying in a Hilton Deluxe Room, Hilton Guest Room or Hilton Spa Room Valid up to 31 Aug 19. Date restrictions apply. 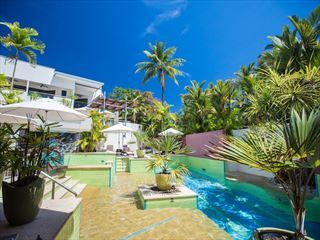 Step into paradise at Peppers Beach Club, surrounded by the beautiful Palm Cove Beach and Coral Sea. 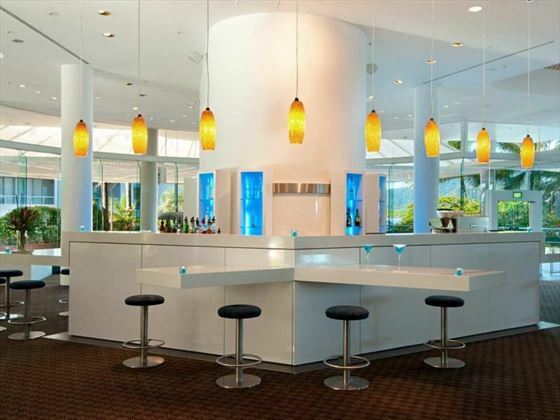 Here you'll be able to enjoy luxury amenities in a gorgeous, tropical setting, with soaring palm trees and fantastic balcony views.